Monster distortion in a mini package! All sockets on top end panel! No – really!!! Comes with an Igor foot-controller – with two available pressure sensitivities. 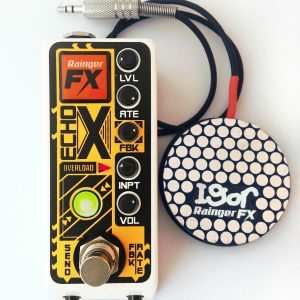 This was the world’s first boutique mini-pedal – another first for Rainger FX! It’s an extreme full-on fuzz distortion – the same circuit as that used in the Dr Freakenstein Fuzz DrFF-3 (click here for that page), and it’s housed in our own original design steel enclosure. It has one main knob, which controls the harmonic overtone pitch. This aspect can also be controlled by Igor – a small round pressure operated foot-controller. When it’s plugged in, the main knob becomes the ‘range’ setting for the controller’s operation. The output volume is adjusted by the thumbwheel. All the sockets are mounted on the top end panel, so if you have a space 41.5mm wide on your pedalboard, Dr Freakenstein’s Dwarf will slot right in. No extra room is needed for side-mounting jackplugs – a unique feature among mini-pedals. Plus it’s narrower than all others, and comes with Igor to add a real-time expression facility to your playing! 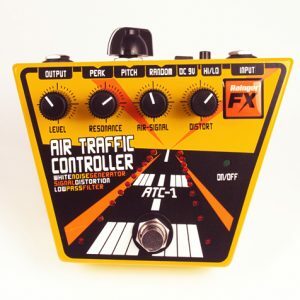 Can I use a regular expression pedal with it instead of Igor? Most probably yes, but you’ll need a ¼” to minijack adaptor. Can I use 5v CV instead of Igor? You can. It works a bit strangely, but you can do it (if you have the right adaptor/lead to fit the minijack socket). Can I adjust – or switch off – the noise gate? No – the noise gate is part of the whole way it works, and can’t be adjusted or seperated like that. Can I use a regular expression pedal with it? Most probably yes, but you’ll need a ¼” to minijack adaptor. 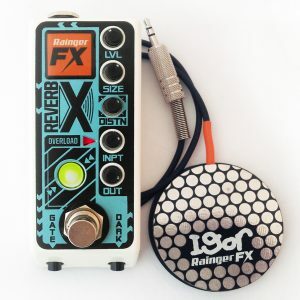 Can the same Igor work different Rainger FX pedals? Yes. Can I use more than one at once? Not with the DrFF-3; it either works with ‘Overtone’ or with ‘Mod. Range’, and can’t do both at once (even if you plug in two). Can I use it with my hand? Yes – it has dual sensitivity. What are the dimensions? 55mm in diameter, 9mm thick. Does Igor use a battery? No – it’s entirely passive. Can Igor be used in place of an expression pedal for different makes of effects pedal? Quite possibly – though all regular expression pedals vary in resistance, and often with wiring. Of course you’d need a minijack to ¼” adaptor. Igor works pretty good with Electro Harmonix stuff BTW. What is the resistance of Igor? He goes from about 1M Ohm down to tens of Ohms. Do you ship internationally? Yes we do. Standard or trackable. What warranty do you give? 3 years. There shouldn’t be, but if there is a problem do get in touch. How can I pay? Paypal or electronic transfer are the usual methods. Do you do any stickers or T-shirts etc? Got stickers – just ask. T-shirts – coming soon. 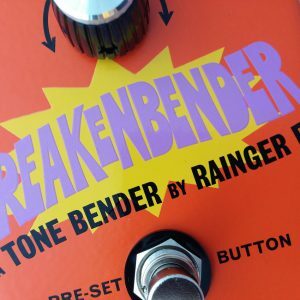 Are Rainger FX pedals true bypass? Yes they all are. How are your audioclips recorded? Usually with my Gibson SG, and – unless otherwise stated – always plugged straight into the one effect only and then into a mixing desk and onto a computer using Logic, no EQ or other tweaking. Where are your pedals made? All are made in the UK.